What color does a baby girl wear most often? Pink, of course! Naturally, pink baby booties are needed for her layette. But, wouldn’t it be nice to have a bootie that would match lots of colors? Not everything in her layette will be pink. Girls like to change it up a bit. ;) So, I created a pink bootie with a cuffed rainbow top. • Made with Caron Simply Soft acrylic yarn for your baby girl’s comfort. 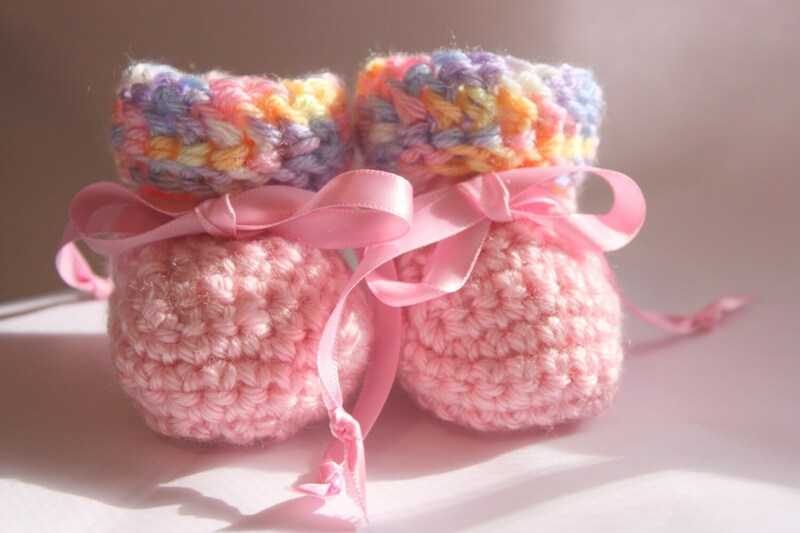 • Secured to tiny feet with a pink satin ribbon. The ribbon is easily detachable, if so desired. • Designed to match many outfits with a variegated coloring of pink, purple, orange, blue, white and yellow. • Sized for newborn to 3 months. • Easy care. Can be machine washed on delicate cycle with a gentle detergent such as Dreft or Woolite. Always such a pleasure to do business with Marcia. I love her baby booties. I’m never disappointed, because they have all been just beautiful. Thank you Marcia for the extra special gifts that you tuck away in my package. Your booties are always wrapped so pretty. So classy. I will always highly recommend Marcia’s shop to everyone. Thank you Marcia for another pair of darling little booties. They are perfectly beautiful, like every pair you make. I love them! And thank you for the extra special little gifts. Everything is packaged so special, and with real class. I’m still not through ordering more booties! New pair coming soon. Marcia is wonderful to work with, and she cares a lot about her customer. I will always, highly recommend her shop to everyone. Custom orders will show in the shop as a Hold or Reserved listing. A courtesy reminder (convo) will be sent to the customer who sought the custom order. If these items are not paid for (ordered) within 5 days of the listing, the listing will be returned to the shop and available for purchase by other customers. No refunds. No returns. Every effort is made to package your purchase with care to insure your baby product is delivered to you safely. Payment must be received before your purchase can be shipped. Most orders will be shipped within 3 - 5 days. Most diaper cakes are shipped by UPS. Baby gifts are shipped by USPS. If you are purchasing a gift for someone other than yourself and would like the gift to be shipped directly to them, please include their name and address. Please Note: Shipping time listed is only for completed ready-to-ship items. Custom items or items that need to be created will have a different shipping time. Please convo me, if you need a custom item or more than the listed amount of the featured item. I will give you a projected time frame on those items. All of my baby items are created in a pet-free and smoke-free home. If you have questions, please contact me via the Etsy convo section.